More friends and a blog: Yummy!! 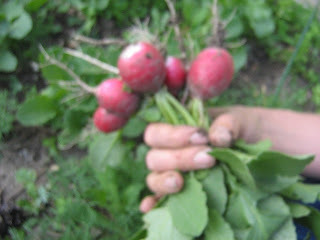 Yesterday we started eating radishes out of the garden - well, E and I did. We used dill from the garden to make tsatziki. Today we had our first salad from the garden. I love being able to go out into the garden and find things to eat already. E noticed today that he could see the berries on the strawberries plants, thankfully he is old enough now to wait until they are red (ish) to start eating them. A few years ago I just resorted to eating them while they were still white with a just a tinge of pink in order to get a taste of them at all, E was eating them all before they were ripe. Yesterday he was picking lettuce leaves and wrapping them around some lamb's quarter leaves and dill and popping them in his mouth to gobble up. Kids who don't like veggies??? Not around here. Wow! Those radishes look good and I don't even like to eat them. Lucky you, to have salad fixings ready to pick. My garden is not as advanced as yours, but I'm happy to say that at some point we'll be harvesting veggies too. you're SO good at taking photos of your life! i realized the day after the tulips were finished that i hadn't taken a single spring photo of them... my favourite is when they're in bloom at the same time as the lilacs, but i missed it by a day. we ate our first crop of radishes a few weeks ago, but our second crop is coming on strong. and our new strawberry plants are looking SO good! need to finish mulching them with pine needles. the places i've done hold the moisture so much better than where there are no needles. see, i would've thought your son was colourblind, eating green strawberries. mine does that too and i'm sure he IS colourblind. but not tested yet. maybe he's just impatient! ha!